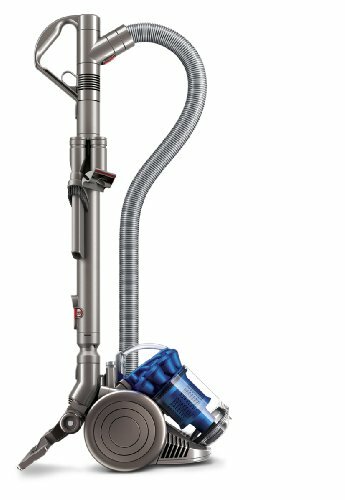 The Dyson DC26 Multi floor vacuum cleaner is not only lightweight, but it is also a very compact unit. It has a brush bar which has stiff nylon bristles designed to remove ground-in dirt from your carpets. The ultra-fine carbon filaments are able to remove the dust from any hard floors. It’s powered by an air driven turbine and is ideal for most hard floors and any short pile carpets you may have. The unit can maneuver easily and will clean in narrow gaps too. It comes with some extra tools including a crevice tool and combination brush. NB: If you’re ready to buy the Dyson DC26, make sure you check it out at Amazon: CLICK HERE. Dyson is a fairly recent company having been founded in Bath by James Dyson. He had been developing ideas since the early 70’s, but founded the company in 1993. They now employ over 5000 staff and are in 65 countries worldwide. If you’re the type of person who would rather have a vacuum cleaner which isn’t heavy to pull or push around, then this one might be for you. It’s incredibly lightweight at only 12lbs, but not only that, it’s also very compact. So much so that it fits onto a piece of A4 paper! Despite being light and small, it still works as well as many larger rivals. Because the bin on the unit is transparent it means the user can see how much dirt, pet hair, and dust has been picked up by the machine. This means you can keep a check on how full it is and prevent a mess when emptying if it’s over-full. Just hold it over a bin, press the button and release the dirt. Having a detachable handle means the tools easily fit to the end of the hose so it’s able to clean in tight corners and spaces. Having a hose for these tools to fit onto means there’s much more flexibility in the cleaning, plus the overall reach is extended. The floor tool has two airflow channels. These are separate and are there to ensure the suction is even and picks up as much dust as possible. The very clever root cyclone technology in the Dyson DC26 Multi Floor Vacuum Cleaner allows the unit to pick up particles as small as 0.5 microns in size. It uses centrifugal force, meaning there is no loss of suction as the cleaner doesn’t rely on bags to trap dirt. In regular vacuum cleaners the tiny holes in the bag gradually get clogged up and this reduces suction power. With Root Cyclone Technology spinning the air, it creates the very powerful centrifugal force which forces dust, dirt and pert hair out of the airflow and into the bin. There’s no doubt that being compact makes it really easy to handle, it will fit into smaller areas and if you’re limited with space, is easy to store away. It’s Dyson’s smallest and lightest canister cleaner, but it works just like a full-sized cleaner with no loss of suction. This has to be a big plus whether you’re short of space or not. Not everyone prefers bagless cleaners but bags can sometimes cause loss of suction over time as the tiny holes begin to clog, but not with this one! There’s also the added cost saving of not having to buy replacement bags. There was some mentions from customers that the power cord could be longer. This is a justified point but with the hose extension that comes with it, the overall reach is 26.2 feet which is pretty good. It is certainly a piece of home cleaning equipment that gets excellent results. You can use it to clean both carpets and the hardwood floors. The Root Cyclone Technology is very clever and makes a huge difference to its cleaning capabilities. It’s been well built to last a long time, its performance is really good and we believe the Dyson DC26 Multi Floor Vacuum Cleaner is definitely worth considering. Take a look at our article How to Choose a Canister Vacuum Cleaner.